Our office is open Monday through Friday from 8am to 5pm. Our caregivers can work any hours needed. 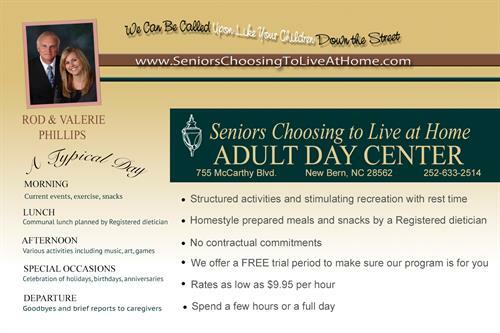 Seniors Choosing to Live at Home offers an alternative to assisted living centers by providing in home care to seniors; and now, an on-site senior day center allowing respite periods for primary care givers while their loved ones enjoy socialization, activities, and support, individual to each member's needs and interests. Our mission begins with the belief that people have earned the right to maintain an independent lifestyle at home and/or in a safe, attentive, worry free atmosphere. Our passion is to provide quality and affordable services, to promote worry free living. We offer personal care, companion, health care, food management, housekeeping, and home maintenance services. We can be called upon like your children down the street. Our staff has identified key areas that can be difficult to manage for many people, and we allow you to pick and choose areas you may need help with. People who use our services include those in good health who need occasion meal preparation, transportation, or an unscheduled repair, members with consistent needs such as housekeeping and personal care, and members discharged from the hospital who temporarily need help while recovering. We also work with people who have dementia and disabilities. While our founders began their careers in more traditional senior living settings, they saw an opportunity to give seniors a chance to live at home while still getting the assistance they need. We are located at 755 McCarthy Blvd., near Glenburnie Road in the medical office area.